Olentangy Liberty’s Matt Rohl (9) takes down Reynoldsburg quarterback Michael Whatley during a Division I regional semifinal earlier this postseason at DeSales. One thing’s for certain when it comes to Friday’s Division I state semifinal between Olentangy Liberty and Lakewood St. Edward: the stage won’t be too big for either team. The Eagles (9-3), fresh off their seventh regional championship, have won three state titles, most recently in 2015. The Patriots (9-4), meanwhile, wrapped up their third straight regional crown with last week’s 21-7 win over Dublin Coffman. The Patriots have been as steady on the defensive side of the ball as a team can be through the first three games of the postseason. They’ve only allowed two touchdowns — a first-quarter score in the opener against Gahanna and a fourth-quarter tally in the win over the Shamrocks — and forced eight turnovers (five fumbles and three interceptions). Hale said the defensive success come down to simple execution. Coordinator Ed Miley has dialed up some dynamite game plans … and the players have taken care of the rest. And he’ll need to come up with another this week. St. Edward, as any team at this level would, certainly provides a challenge. Jordan Castleberry is the proverbial head of the snake. He’s rushed for an even 1,400 yards and 16 touchdowns so far this season. St. Edward quarterback Garrett Dzuro can also move a little when he gets out of the pocked, collecting 988 yards and 10 touchdowns up to this point. Dzuro is no slouch when it comes to throwing the ball, either. He’s completed 122 of his 190 passes for 1,630 yards and 19 touchdowns. Quintel Kent has been his top target, hauling in 46 receptions — nine of them for touchdowns — covering 745 yards. Offensively, the Patriots have leaned on quarterback Mitchell Okuley. 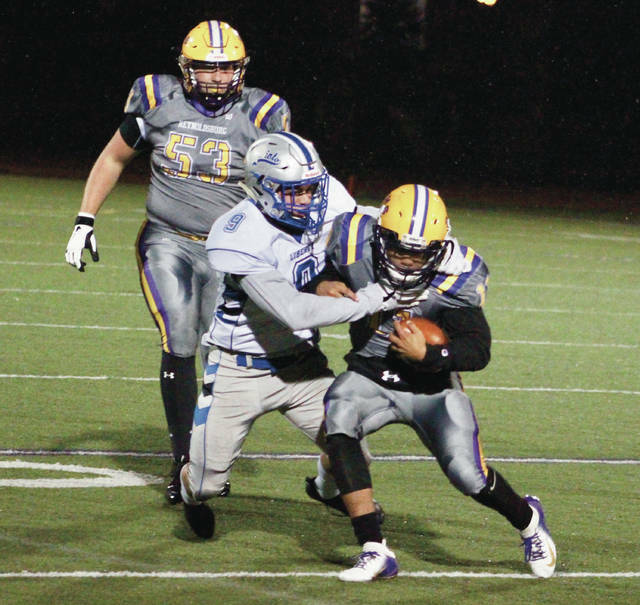 He had the lone touchdown in the 10-o regional semifinal win over Reynoldsburg — a 44-yard run — and ran for all three of his teams scores in last week’s win over Coffman. Friday’s game at Mansfield’s Arlin Field will make the second-ever meeting between the two schools. The Patriots will look to avenge a 41-12 playoff loss to the Eagles (2014) when the two teams get after it. Kickoff is set for 7 p.m.